As you read these words, are you aware of an experience of “body”? Is there any awareness as you read, of your feet on the floor, your seat in the chair, of the breath? Or is the body simply a vehicle for your head? In our culture today, the body appears primarily as an object, an “it,” broken down into manageable bits for study in labs, dressed up to look good, taken to the gym to be worked out. The actual experience of the body as lived is a kind of cultural blindspot. We rarely, if ever, experience the body as a living organism, the actual basis of all our experiences. It is thus strangely fitting to turn to research in Artificial Intelligence for insight into ourselves as moving systems. The attempt to build robots that imitate biological systems—in these examples, a mechanical cockroach, a walking robot and a tuna –starkly reveals misconceptions we have about ourselves as moving beings and suggests new directions for our approach to exercise. 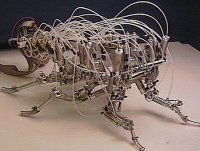 To unlock the mystery of the cockroach’s ability to climb, scientists and engineers start with pure mechanics: a careful analysis of joint positions leads to a blueprint for a giant robotic cockroach. Unfortunately, having the right structure is just the shell: the machine can’t even stand up. “Structure” is too limited a point of view for understanding movement. Progress comes when the researchers look at the sequence of movements that go into the cockroach’s renowned climbing ability: the three sets of legs coordinate, one set reaching, another pushing and the third stabilizing, to allow the roach to climb over obstacles. How do we apply this insight in our own experience? Take weight training for instance: will strengthening individual muscles lead to better movement? Is it even possible to strengthen one muscle at a time? As the mechanical cockroach demonstrates, many muscles with different functions work together to perform any action. No matter what the specific action, lifting a weight or reaching for our tea-cup, the rest of our brain/body is busy with the task of making sure we don’t fall over in the process, keeping our head oriented and our gaze stable. In fact, an enormous amount of a movement’s organization takes place before we actually move. Based on the available information, the brain makes decisions to keep us in balance. To actively include coordination in our approach to intelligent exercise would mean tuning in to the body’s need for stabilization before action: Taking a moment to feel our feet on the floor, to allow our chest to rest comfortably over this base, to allow our gaze to orient the head—setting a different basic tone before lifting the weight itself. The need for coordination leads us directly to a change in what we are paying attention to—a change in perception. 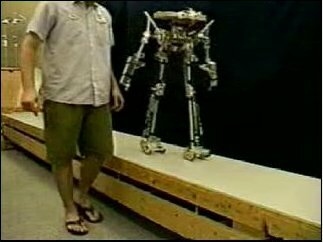 In another example from robotics, the challenge is to make a robot that can walk down stairs. This turns out to be not so hard–as long as the stair width never changes. A task most of us master with ease after a year of life is one of the thorniest problems of artificial intelligence. Moving depends on being able to locate ourselves—“proprioception”— the sensory and perceptual information that lets us know where we are and where we are going. Proprioception has two aspects: the sensations from within—interoception–and the perceptions of the world around us—exteroception. This capacity is part of what allows us to adapt our movements to changing conditions as we meet the world. All that is necessary for the development of this skill is there from a baby’s first day, but to build this level of complexity into a robot still defies us. Perhaps because the original perceptual skills come to most of us so naturally from childhood, we don’t recognize perceptual/sensory input as an essential aspect of movement and so don’t preserve our amazing abilities. While robots are advancing in this arena, we, as adults (and maybe children, too) are falling behind: Research suggests that some symptoms (loss of balance, for example) that have been associated with aging may be primarily due to a diminishing range of sensory perception. We sit in cars and at computers, watching images on screens located only in front of us (one dimension instead of three). This diminishes the use of our peripheral vision. It numbs us to the rich kinesthetic input coming from the sense receptors all through the body. Tuning into our ipods, we tune out the world that would naturally stimulate our auditory orientation. We give our movement systems a poor diet of repetitive motion on exercise machines while we stare at a television monitor. The treadmill that simplifies our exercise routine deprives our feet of responding to an ever-changing terrain, stressing our joints and increasing the likelihood of injury. Graceful movement does not come merely from pre-established ideas of good posture or motor programs. It is a movement in response to many signals from the environment. A beautiful illustration of this came at a dance performance of a group of three year olds. Of course they had not memorized any complex choreography. Instead, the program began with their teachers throwing feathers into the air—in response and almost as one, all the children looked up and raised their arms, reaching up to catch the slowing falling feathers. When the teachers brought out a large hoop, all the children grabbed a hold and walked in a perfect circle. Their movements were inspired and coordinated in response to changes in the environment. This makes up another aspect of intelligent exercise: a rich, changing, multi-sensory environment to stimulate movement and perception. In the process of making a robotic tuna, researchers discover the secret of its powerful, efficient swimming: jet propulsion. 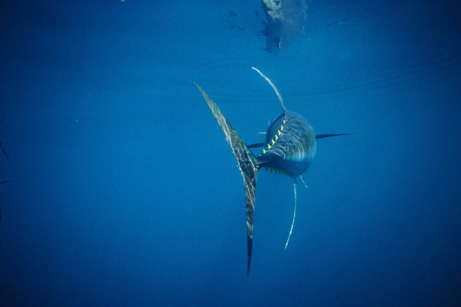 The tuna’s large, vertical tail flicks the water to one side, forming a spinning vortex; and to the other side—another vortex. When the two vortices combine behind the tuna, it gets jet propulsion, i.e. the water pushes the tuna. Instead of expending unnecessary energy to pull itself through the water, the tuna mobilizes the forces available in the environment to do the work. This brilliant adaptation makes the tuna one of the ocean’s top swimmers. In theory humans have evolved to navigate as skillfully and effortlessly in our “ocean,” the field of gravity. Our bodies are capable of using gravity to assist, and not just to resist, our movements. Unfortunately, this is rarely our felt experience. Unlike the tuna and most of our far ancestors, our survival no longer depends on the efficiency of our movement. A tuna that expends too much energy to get around will be removed from the gene pool—i.e., eaten. Not so for us. With that constraint gone in human society, we are “free”—for better or for worse—to move without efficiency, free to work against gravity instead of with it. While our lives may not seem to be immediately at stake, we pay for our inefficiency in tension, lack of energy, bad posture and joint injury and pain. And we may be paying in more subtle ways: Neuroscientists are providing more and more evidence that the felt experience of our body, conveyed via sense receptors, is the basis for our sense of self. The experience of moving may be the basis for thought process itself. When we are fighting gravity, the feeling we get from moving no longer reminds us that we are part of the earth, supported and connected. Rather than feeling “inspired,” we feel we have to “take” our deep breaths; instead of resting on the planet, we hold ourselves up, ending up tense and tired. Instead of letting go into each movement (moment), we are the “at work nation,” wasting our energy pushing the river. When we exercise from this basis, we actually reinforce our chronic tension, mental and physical. We may be creating a sense of self that is separate and at odds with the planet. Intelligent exercise is a chance to practice a different point of view: Rather than use our exercise to become more like a machine, we can take advantage of the time to tune in to our sensations and experience “body” as a relationship with the world. Honing a good relationship with gravity while we exercise means taking the time to discover what unnecessary tension we are holding. Instead of concentrating on how we look, or how we wish we looked, we can pay attention to the sensations we are experiencing at this moment, letting our senses exercise too, by attending to the sensations from within and to the many signals—sounds, sights and movement—from without. This way, we may find ourselves able to receive the support that is already there. With this kind of exercise, we may begin to experience for ourselves the wonderful feeling of letting go into movement, of being held on the planet by great forces, receiving the air every breath and letting go into the next moment. Let us learn from the researchers in artificial intelligence to appreciate ourselves as amazing movement systems. Then through felt experience, exercising can become a reminder of the beauty and complexity of being alive. Artificial Intelligence exhibit at MIT Museum, Cambridge, MA, 2005. Gurfinkel V (1994) The Mechanisms of Postural Regulation in Man, Soc Sci Rev. F. Phys Gen Biol. 7 59-89 . Cole J (1995) Pride and a Daily Marathon. Cambridge: MIT Press. Gracovetsky S (1988) The Spinal Engine. Springer-Verlag. Gracovetsky S (2001) Analysis and Interpretation of Gait in Relation to Lumbo-pelvic Function, 4th Interdisciplinary World Congress on Low Back and Pelvic Pain, Montreal. Craig A (2002) How do you feel? Interoception:the sense of the physiological condition of the body. Nature Rev. Neurosci. 3, 655-665. Llinas R (2001) I of the Vortex, from Neurons to Self. Cambridge:MIT Press. Berthoz A (2000) The Brain’s Sense of Movement. Cambridge:Harvard University Press. Damasio A (2003) The Person Within. Nature:423, 227. This entry was posted in Body Imagining, Train of Thought by aline. Bookmark the permalink.